With spectacular art and architecture, stylish Michelin restaurants and cozy bistros, snazzy cabarets and haute-couture boutiques, the City of Light has an élan that’s unmistakably unique. But, with the September 2016 opening of The Parisian Macao, French savoir-faire has finally come to the China coast. A stone’s throw from Hong Kong, The Parisian is in the heart of Macao, the 16th-century Portuguese colony turned gaming haven. An integrated theme resort, the five-star property has a 3,000-room luxury hotel, an elegant casino, 170 designer shops, seven gourmet restaurants and a food court. 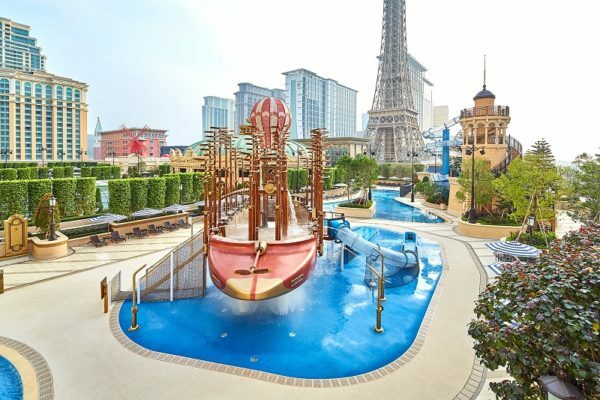 Also on-site: Le SPA’tique spa, a fitness center, a 1,200-seat theater and a water park—not to mention a 1,062-foot-high replica of the Eiffel Tower. Designed by Gensler, the award-winning San Francisco firm, The Parisian is the latest addition to the legendary Sands gaming-and-hospitality empire. 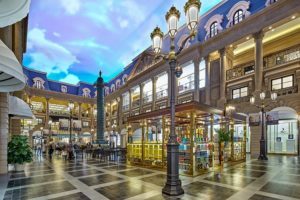 The corporation also has two resorts in Las Vegas, The Venetian and The Palazzo, plus the Marina Bay Sands resort in Singapore, and eight resorts in Macao, including The Venetian Macao, complete with canals and gondoliers. With high-quality accommodations, dining and service, The Parisian is as elegant as it is showy. Guided by visionary Sands Chairman Sheldon G. Adelson, The Parisian was designed to attract a cross-section of guests, from romantic couples to families, from gamblers to non-gamblers. Getting to The Parisian is half the fun. From Hong Kong, high-speed ferries cruise an hour west across the South China Sea to Macao. The cobalt-blue Cotai Water Jet, owned by the Sands group, looks like a seagoing stealth bomber. Cotai Class offers an airplane-style cabin with overhead bins and leather seats. There’s also First Class and an eight-seat V.I.P cabin. The Macao Terminal & Heliport near the Outer Harbour is closest to the Old City and casino-hotels like the landmark Sands Macao, opened in 2004. 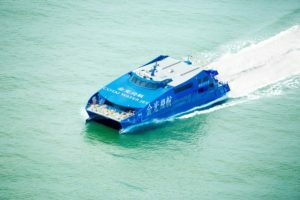 The Taipa Ferry Terminal is south, closest to Macau International Airport—a 15-minute flight from Hong Kong—as well as The Parisian and other Sands resorts on the palm-lined Cotai Strip. Outside the terminals, colorful motor coaches from various casino-hotels await guests. I hop aboard The Parisian’s hot-pink bus emblazoned with—what else?—a gold Eiffel Tower, and, five minutes later, we’re facing the hotel’s version of the famous French monument. Seeing The Parisian’s Eiffel Tower, I’m instantly humbled. The idea of recreating one of the world’s most famous landmarks initially struck me as sheer hubris. But The Parisian’s Eiffel Tower is an engineering marvel. Rising 38 stories and half the original’s height, it took 130 workers a year to build, using not wrought iron, as Gustave Eiffel did in 1899, but 3,000 tons of steel. Outside, The Parisian’s Eiffel Tower has two observation decks and, inside, a gourmet French-Asian fusion restaurant, La Chine. Beneath an elaborate Beaux-Arts-style porte cochère—inspired by Paris’ Gare du Nord train station—are tall gilded doors reminiscent of the Palais Garnier, the city’s ornate opera house. Entering The Parisian, my jaw drops. Dominating a French Neoclassical rotunda is a huge bronze-and-gilded fountain with sculpted figures representing the Mediterranean and other seas. Surrounding the fountain—a recreation of the Fontaine des Mers in Paris’ Place de la Concorde—gold-capped Corinthian columns soar 82 feet to a frescoed dome, inspired by the Hôtel National des Invalides, Napoleon’s resting place. 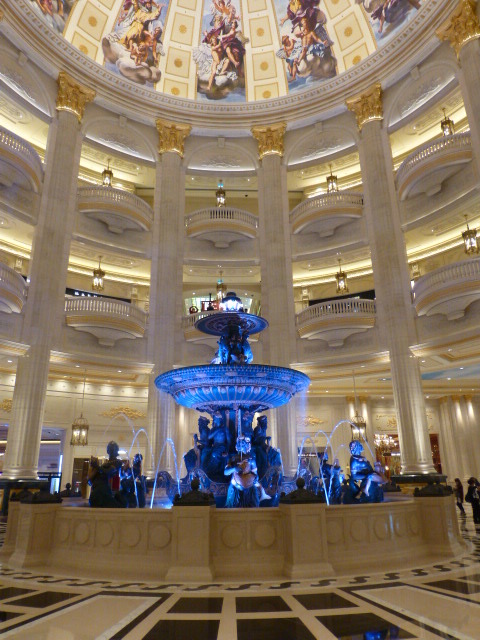 As piped-in classical music wafts through the lobby, the fountain puts on a brilliant blue-and-green light display. Call it showy. Call it over-the-top. But you’ll be just as transfixed as I was. Red and gold, with a painted barrel-vaulted ceiling, nearby Hotel Reception evokes Versailles, Louis XIV’s palace just outside Paris. Above the long counter is a replica of “The Coronation of Napoleon,” an 1807 work by Jacques-Louis David, now in the Louvre Museum. Having booked a suite, I’m ushered to the V.I.P. Lounge, a high-ceilinged powder blue-and-white room with gilded furnishings. As I sip coffee and nibble on petits fours, a handsome young man, with exquisite old-world manners, hands me a leather portfolio and requests my signature. After check-in, I head down several long marble corridors, past a dozen-and-a-half jewelry and watch shops with names like Cartier, Rolex and Tissot. Discreetly tucked away in the central area, the first-floor casino is easy to find if you’re a gambler, but equally easy to miss if you’re not. I’m in the latter category, more interested in culture, fine dining and entertainment. Though high-rollers and slot-machine jockeys will always be warmly welcomed in Macao, I’m the new breed of visitor that Sands Chairman Adelson is also hoping to attract. My home-away-from-home, the 775-square-foot Lyon Suite, has a well-appointed living room, in restful tans and browns, with a couch, coffee table, easy chair, desk and big-screen TV. For guests from the East, who absolutely adore foot massages, as well as weary Road Warriors from the West, there’s an electric foot massager. My spacious bedroom features a queen-size bed swathed in premium linens and down. And looming right outside the windows is the Eiffel Tower. Below, on Level 6, The Parisian’s Recreation Area includes a Pool Deck with a heated lap pool, a swimming pool and three Jacuzzis—plus a 30-foot-tall windmill modeled after the one outside the Folies Bergère cabaret in Paris’ Montmartre. Beside it, the indoor-outdoor Qube Kingdom has climbing equipment and slides, game consoles, and a traditional merry-go-round reminiscent of the carousel in the Luxembourg Gardens. Aqua World features water slides, water jets and an aqua tube plus a climbing net and a swinging bridge. The Marie Antoinette Tower, with two spiral waterslides, evokes the queen’s Versailles retreat, and the 50-foot-high Jules Verne Airship, topped by a big red-and-white balloon, recalls hot-air balloon inventors, the Montgolfier brothers. 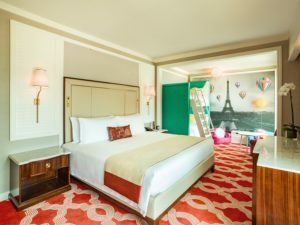 If I had a kid or two in tow, I’d book a Famille Room, with a king-size bed and round dining table for adults, and a separate children’s nook with bunk beds, pink and blue beanbag chairs, a table for hands-on projects, and a black-and-white mural of the Eiffel Tower overlaid with colorful balloon pictures. Once unpacked, we’d carve out some quality time at Qube Kingdom or Aqua World. Instead, I’ll explore Old Macao. A UNESCO World Heritage Site, the 16th-century Portuguese town charms with streets paved with black-and-white mosaics of ships, anchors and seashells, flower-filled alleys and fountain-adorned squares. Among nearly two dozen landmarks is the elaborate hilltop façade of 17th-century St. Paul’s Church. A 15-minute drive south of The Parisian, Old Macao is easily reached on a complimentary motor coach from the City of Dreams hotel complex. In Macao, casino-hotel buses are free to all visitors, both day-trippers and overnight guests. 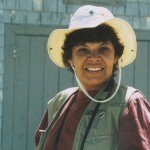 Getting to the ferry terminal, airport or a hotel for dinner or a show is a breeze. Enchanted by Old Macao, I return to The Parisian four hours later. With a table waiting at La Chine, the Eiffel Tower’s gourmet French-Asian fusion restaurant, I head into my spacious white-marble bathroom, quickly shower and choose a smart-casual outfit—a navy blue-and-white tunic, white slacks and black leather pumps—from my endlessly long walk-in closet. Of The Parisian’s seven restaurants, La Chine is the most elegant. Lotus Palace offers Asian fare ranging from casual dim sum to elaborate dishes like fried Sri Lanka crab with garlic and red chili while The Brasserie serves typically French dishes like buckwheat crepes with Emmental cheese and steamed mussels with white wine. Open for breakfast, lunch and dinner, Le Buffet’s Herculean breakfast features several cooking stations, ready-made eggs, bacon and sausages, roast pork and ham carved off the bone, a long Asian counter with dumplings and noodles, and acres of breads and pastries, meats and cheeses, fruits and yogurts, and salmon, smoked fish and caviar. You’ll also find three casual restaurants: Café Express, a traditional tea restaurant serving light dishes and Hong Kong-style milk tea; Market Bistro, a 24-hour Asian noodle shop, and the Parisian Pool Café. In the Food Court are eight Cantonese, Japanese, Taiwanese and Vietnamese eateries. En route to La Chine, I pass some of the Shoppes at Parisian, 170 boutiques showcasing world-class designers like Calvin Klein and Sonia Rykiel along thoroughfares recalling Paris’ glitziest shopping venues: Place Vendôme, Avenue Montaigne, Rue du Faubourg Saint-Honoré and Avenue des Champs-Elysées. 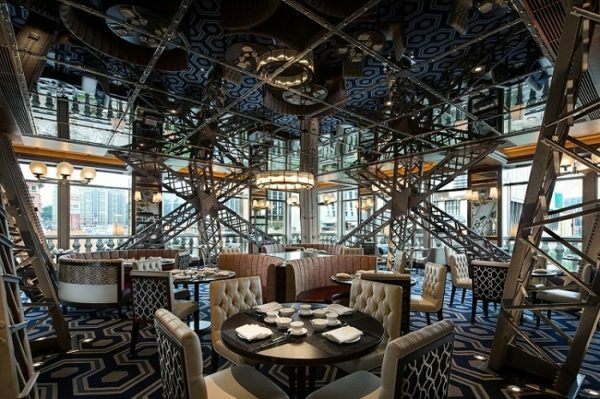 In La Chine, tables and banquettes are attractively arranged around big steel girders just as in the real Eiffel Tower. Exquisitely wrought French-Asian fusion dishes include intriguing choices like sautéed prawns and scallops in black truffle sauce, Sichuan-style braised lamb shank with cumin and crispy pastry, and fried monkey head mushrooms with sweet-and-sour sauce. The Eiffel Seafood Tower has nearly two dozen shellfish, including a Boston lobster, two Alaskan crab legs and eight assorted oysters like sweet-and-salty Gillardeau from western France. Sampling several appetizers while sipping a “French Kiss” cocktail with sparkling wine, Chambord and honey, I glimpse the tower’s twinkling lights through surrounding windows. Every 15 minutes, from 6:15 p.m. till midnight, the tower puts on an unforgettable sound-and-light show. From two observation decks, you can see the sparkling lights of The Venetian and surrounding hotels. Dinner at La Chine is the perfect farewell to my whirlwind 24-hour visit. With an extra week or two, I could have sampled all seven restaurants, browsed through most shops, booked treatments at Le SPA’tique, and taken in a show or concert. I might even have careened down the Aqua World waterslides. 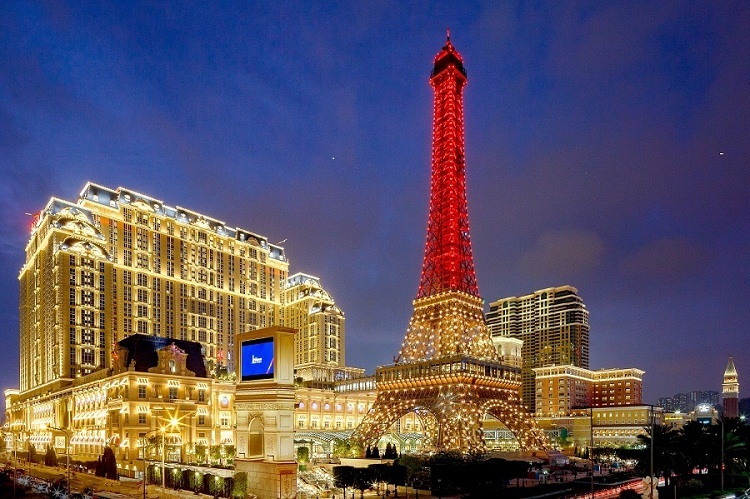 I could have explored The Parisian’s six sister hotels on and around the Cotai Strip. 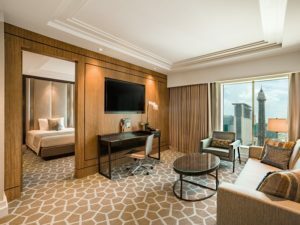 There might have been a romantic gondola ride on The Venetian’s canals or tropical high tea in the Sheraton Grand Macao’s Palms lounge. After a gemstone treatment in the silver-and-white Iridium Spa at The St. Regis, I could have sampled oysters at The Verandah crustacean bar or enjoyed an elegant dinner amid artworks at The Manor. Later, I could have taken in “The Monkey King,” an elaborate extravaganza of Chinese dance, music and acrobatics, at the Sands Cotai Theater. Who knows? This confirmed culture maven and gourmet foodie might even have taken a turn at the roulette wheel or tried my luck with a one-armed bandit. At the sparkling new dream factory called The Parisian, anything is possible. The Parisian Macao. Estrada do Istmo, Lote 3, Cotai Strip, Macao, People’s Republic of China. 853-2882-8833. www.parisianmacao.com.